Employing photography, moving image and sound installation, Peter is interested in how different mediums can explore and understand both ourselves and others. Responding to Surface Gallery’s main gallery space, each piece will work individually while also combining to create a thought-provoking experience for viewers. A catalogue, showcasing work from the project as well as containing texts and critical essays will accompany the exhibition. 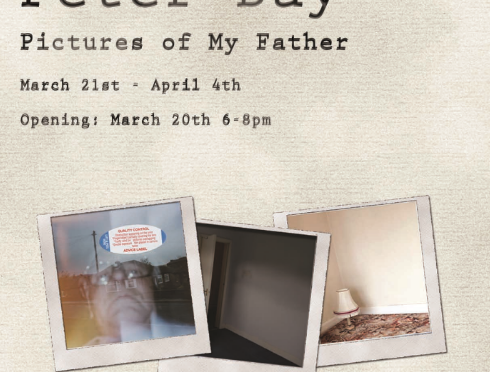 Visitors are invited to see the work that has emerged from Peter’s research when Pictures of My Father opens at 18:00 on Friday 20th March. This will be accompanied by a poetry reading at 19:00 by Bill Greenwell, which will draw on the same themes, as well as presenting the quirky material for which Bill is better known. Bill Greenwell has been published as a parodist and poet for almost forty years, and he has won two thousand competitions. He also runs the influential Poetry Clinic. In addition to his political and satirical material, he is known for his offbeat investigations of love and death.